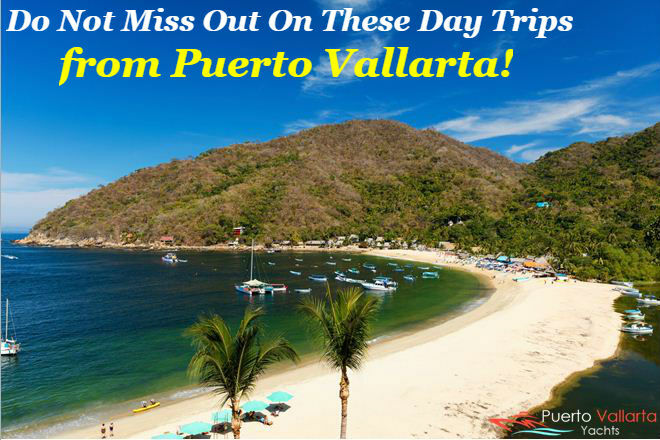 Do Not Miss Out On These Day Trips from Puerto Vallarta! Puerto Vallarta is one of those places in the Mexican Caribbean that you'll end up visiting again and again. From fishing to scuba diving to snorkeling – the city is packed with endless things to explore and enjoy. Due to its location in the middle of Banderas Bay, the visitors have access to countless options. Hop on your own private charter in Puerto Vallarta and sail to the North to visit the town famous for surfing. You can also make your way towards South to reach a destination which looks like a beautiful movie set. Whatever you want to do, there are plenty of options for a perfect day-long getaway from Puerto Vallarta. Yelapa – Yelapa is one of the most magical places in the Banderas Bay, the small beach town is only accessible by boat. Don't worry, it is only a forty minute ride and you'll be transported into another world. If all you want to do is relax, take a seat on one of the lounge chairs and sip pina coladas all day long. Wander through the cobblestone street and interact with the locals and take pictures along with them. Keep an eye out for the pie lady who brings freshly baked slices of pie each day. If you're up for some adventure, Yelapa is a perfect place for parasailing, and there is a hike to a small waterfall that's definitely a must see. You can also be part of a fishing escapade while here. Hop on board your own private fishing charter in Puerto Vallarta and enjoy catching yellowfin tuna, dorado (mahi mahi), marlin, sailfish and more in the waters surrounding Yelapa. Islas Marietas – Although visiting this island requires a bit of planning, it’s worth visiting. This small group of uninhabited islands teems up with marine life. The island now is a national park, so even humans aren't allowed to step foot on land, but it's a perfect destination for snorkeling and scuba diving. Keep an eye out for turtles, dolphins, whales and multiple species of birds. Your guide will take you to all those places perfect to spot wildlife. Also known as "Love Beach" or "Hidden Beach," this short stretch of beach is completely surrounded by a wall of rocks. Only a limited number of people are allowed to visit! In the Marietas Islands, you can regularly find big sailfish, tuna, wahoo, and other great game fish here. The islands are also the beginning of the trophy fishing area, thus making it the best spot to start your fishing escapade. Sayulita – Located in downtown Puerto Vallarta, Sayulita is a small village which is known as the “crown jewel” of the Riviera Nayarit. This sleepy surfer town is famous amongst both locals and tourists for its beautiful beaches, Mexican culture, shopping, and more. In the recent past, it has become a popular tourist destination, hence the locals speak and understand English. You'll even find a lot of expats living in the area. Sayulita is perfect for surfers of all different levels, but if surfing isn't your thing, you can always go horseback riding, hiking, jungle canopy tours, snorkeling or fishing. Do not miss out on a visit to Los Muertos, or "Dead Beach," and it is here the spirits of the nearby dead perhaps have gathered. San Sebastian – Travel deep in the Sierra Madre to reach one of Mexico's best-kept secrets – San Sebastian. During your journey to this remote village, you will enjoy breathtaking views of Mexico that get even better once you arrive here. San Sebastian was originally a mining town. The gold rush is over, and the town is now cultivating coffee and agave. As you wander through the streets, you can visit the 18th century church, haciendas, and a charming cobblestone plaza famous for its historical character and the most promoted tourist destination. Guadalajara – To visit the capital of the Mexican state of Jalisco and the second largest city in Mexico, you will have to deboard your private charter in Puerto Vallarta. Instead, you will have to travel on the new toll road connecting it to Puerto Vallarta. Considered the home of mariachi music, Guadalajara is a major cultural center of Mexico. It is also sometimes referred to as Mexico's Silicon Valley as it is one of the country’s main industrial and business centers. Explore the most iconic and historic buildings such as the cathedral in the heart of the city. You can also visit Hospicio Cabanas – a UNESCO World Heritage Site. Fishing fanatics from all over the world visit Guadalajara to try their luck in catching the largest creatures that are hard to find. So, if you are planning to try your luck too, then hop on board your fishing charter and search for big game fish. Day trips and fishing tours can add a new dimension to any Puerto Vallarta vacation experience. Puerto Vallarta Yachts can make suitable arrangements for your private fishing charter in Puerto Vallarta to make your vacation experience memorable. Let's plan your next vacation together!